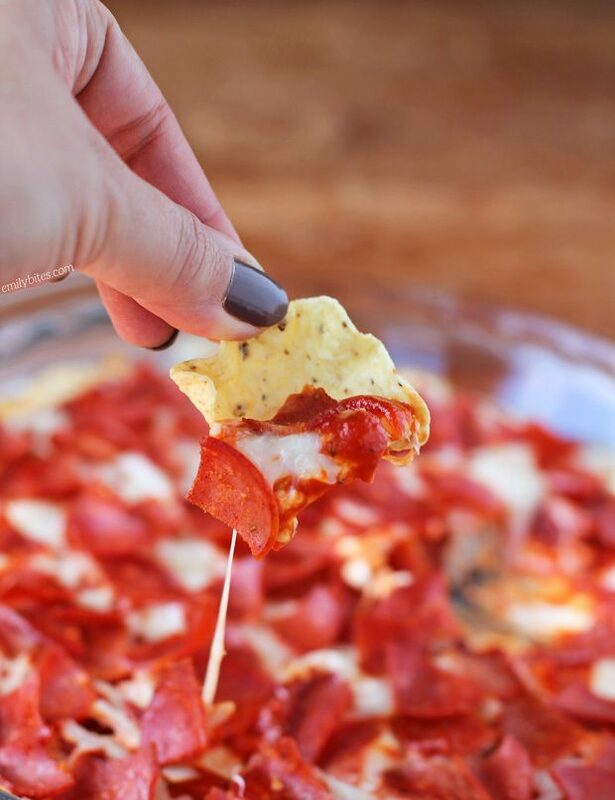 This Pepperoni Pizza Dip is one of the earliest recipes I posted when I started this site and it was due for an update. I didn’t change the recipe, but I did re-write it, give it a less vague serving size, take new photos AND create my very first recipe video (I’m excited)!! I absolutely love this dip and it’s actually one of the recipes I make most from my site. It’s perfect for company because it’s so easy to make, comes together in almost no time at all, and it’s a major crowd pleaser. I almost always double the recipe (just make it in a 7×11 baking dish instead) and we never have leftovers! 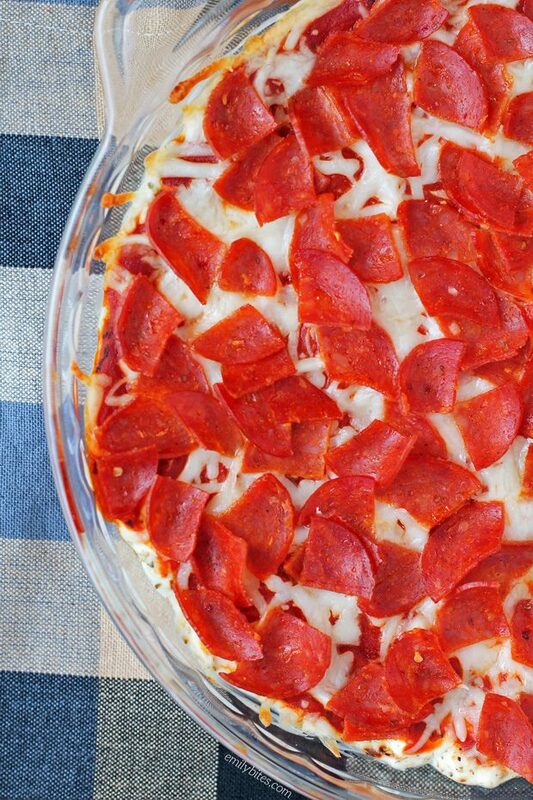 Not only will all your guests ask you for this recipe, but they’ll be shocked to discover that this Pepperoni Pizza Dip is just 121 calories or 4 Weight Watchers SmartPoints per serving. Just serve with veggies, tortilla chips, crostini or pita for dipping and watch it disappear. If you’re on the hunt for more delicious dip recipes, check out my Chili Cheese Dip, Cannoli Dip, BLT Dip, Greek Layer Dip, Spinach & Artichoke Dip, Hot & Cheesy Bean Dip, Beefy Enchilada Dip, Caprese Dip, Creamy Dill Dip and more in my Appetizers category! In a mixing bowl, combine the cream cheese, sour cream, oregano, red pepper flakes and garlic powder and stir together until smooth and well mixed. Spread the cream cheese mixture evenly across the bottom of a 9” pie plate. Pour the pizza sauce over top the cream cheese mixture and spread it evenly across the surface. Sprinkle the cheese over the sauce and then top with the chopped pepperoni. Place in the oven for 15 minutes until heated through and serve. This looks yummy! It reminds me of a dip I’ve eaten that has the cream cheese mixture on bottom and shredded chicken breast with hot wings sauce on top. I need to be on the look out for turkey pepperoni! I made this last night for a group of friends and they devoured it before I even had a chance to tell them that it was healthy! It was delicious and it was requested that I make it again! Thank you! You go, girl, with that Freestyle SP calculation! I just began Freestyle today, was looking for a recipe for tomorrow’s holiday party, and you delivered. Thanks! Can this dish be made ahead and refrigerated until ready to heat? Thanks! Made this for the first time on New Year’s Eve as an appetizer and everyone raved about it. I made it again for Superbowl and two of my friends (who are CHEFs!) ate it all up! Made it again last week before a concert with friends. 3 groups of people and everyone has loved this and requested it be my staple appetizer. Super easy and fun.